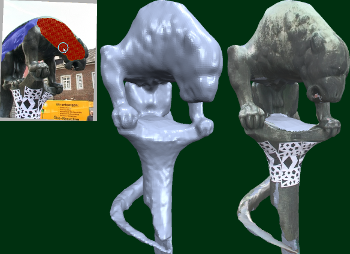 We present the design of an interactive image-based modeling tool that enables a user to quickly generate detailed 3D models with texture from a set of calibrated input images. Our main contribution is an intuitive user interface that is entirely based on simple 2D painting operations and does not require any technical expertise by the user or difficult pre-processing of the input images. One central component of our tool is a GPU-based multi-view stereo reconstruction scheme, which is implemented by an incremental algorithm, that runs in the background during user interaction so that the user does not notice any significant response delay.